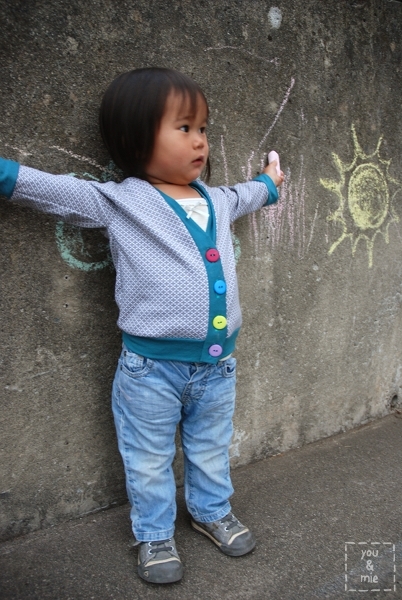 So my latest KCWC project is the Greenpoint Cardigan, a pattern by Adrianna of Crafterhours. She recently started a new pattern shop, hey june, and this is her first pattern for sale (wow, that’s a lot of links). Adrianna was kind enough to send this pattern to me as a gift, but all opinions are my own. The fabric that I used was a knit from Joann’s with a gray plus sign pattern all over it. I rarely see knits with cool prints on it, and I thought this was pretty neat. For the wristband/waistband/neck binding, I used a tissue thin soft knit (same one I used for the FBST I made earlier this week). This turned out to be a total mistake because it’s so thin that it doesn’t hold its shape well and sags around the chest (you can see it folded in the picture below). Looking back at the pattern, I notice that Adrianna TOTALLY warns against using this super thin stretchy stuff, but of course I didn’t realize that earlier – I just thought it was a pretty color. I still have a lot to learn about knits . . . I went with the colorful buttons with my sister’s advice. I think it adds fun and youth to an otherwise more serious print. The pattern is great. It is well written and the diagrams are clear. 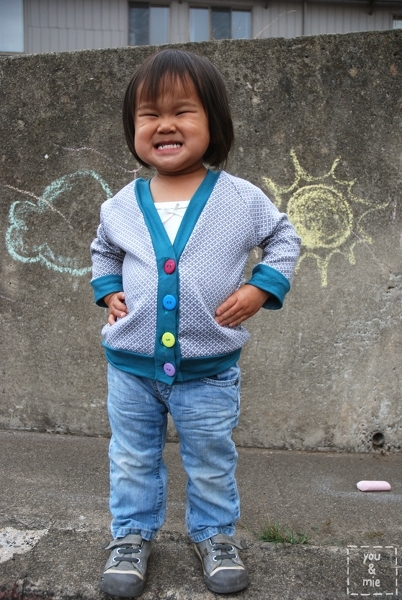 Overall the cardigan is pretty simple to construct and sews up super quick. The size is worked out well for Yuki – I made hers in size 2 and I can tell it’ll fit her for awhile. The only adjustment that I made was to shorten the sleeves. I love that it is a basic pattern with lots of room for remixing. And I LOVE a good unisex pattern too 🙂 I highly recommend this pattern for your library. It’s a great go-to pattern and I will definitely be making up a few more of these. You can find it here. This is how Yuki smiles when I ask her to smile. Awesome, huh? So how are you feeling? The week is winding down, but technically, there are still two days left of KCWC. Are you still sewing or finishing up? I have one more project that I want to tackle before the week is done. We’ll see if I have it in me. 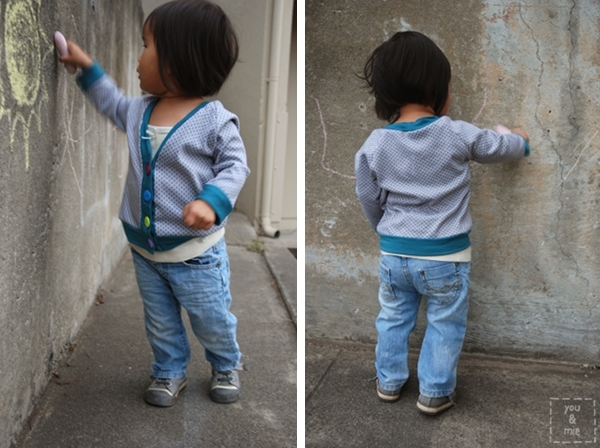 This entry was posted in KCWC, sew & tell and tagged boys, girls, greenpoint cardigan, kcwc, kid's clothing, kids clothes week challenge by Cherie. Bookmark the permalink. Thank you! 🙂 It’s a great pattern! way cool – love the buttons. how much did you shorten the arms, would you say? this is on my list for O! Thanks Kristin. I cut about 1.75 inches off the sleeves. I used my recent FBST to measure the length, but kept it probably an inch longer since it is going to be worn over other clothes. Think it worked out pretty well. Can’t wait to see your version! 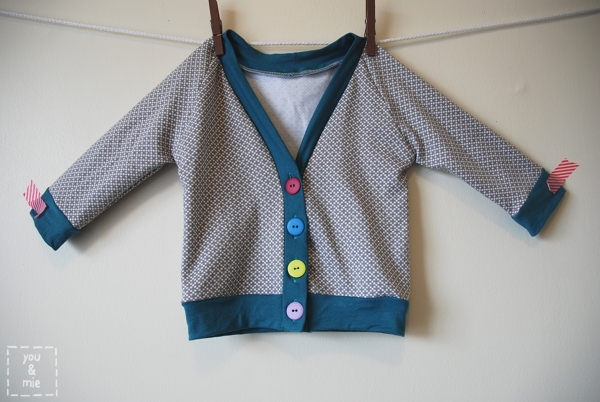 i’m loving all these greenpoint cardigans popping up, this one especially. awesome buttons and fabric and it’s so cute on her. what a great piece for fall. i wanna make one!! Haha, thanks Adrianna! Great pattern. Best of luck to you and Hey June! this is so, so awesome! i love it! i’m trying to finish my last project but am losing stream. if only there were magical fairies who could do all of the cleaning and laundry i’ve been neglecting this week. super cute! And that smile… Oh my. 🙂 I may have to go see if I can hunt down that knit at Joann’s, it’s fabulous. Reminds me of one if the prints in DS’s hope valley line. Did you find it recently? Thanks! Yes, I must have gotten it within the last couple of weeks. I’m pretty sure my local Joann’s is still carrying it. oohh she’s so cute! 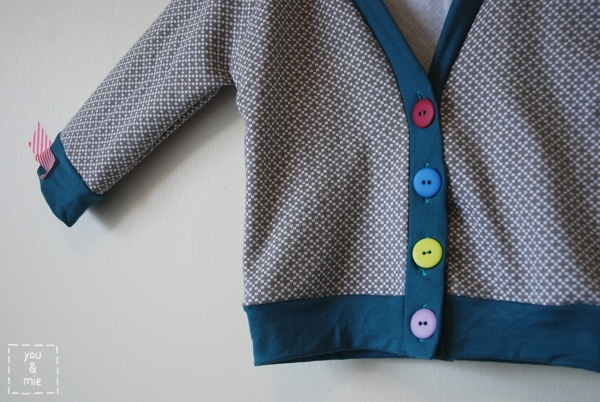 and the cardigan is very pretty! Congrats! at this baby girl allways looks great with your creations! I love this! That knit is awesome. I am totally heading to Joann’s! I love knit cardigans!! I’ve been wanting to make Bug a few for some time now. This one is so darling and the buttons really do make it fun. Yuki is so cute!!! Do you know if something happened to Hey Jude’s shop, I want to buy the pattern but the link is dead now?